One of the events during the Epcot International Food and Wine Festival is the Culinary Adventures in Signature Dining. Here you'll have a outstanding meal prepared by the chef accompanied by a hosting winery. 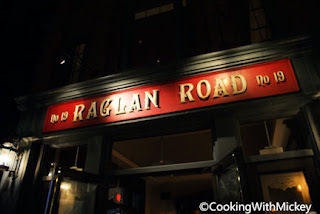 One of these signature dining experiences is at Raglan Road Irish Pub and Restaurant and hosted by Master Chef Kevin Dundon. On Tuesday October 18, 6:30 p.m. enjoy a meal as Kevin Dundon takes you through each dish. Call (407) WDW-FEST or Raglan Road at (407) 938-0300 to book.